John Stuart Gordon is the Benjamin Attmore Hewitt Assistant Curator of American Decorative Arts at the Yale University Art Gallery. Thanks to a freshman seminar class, this rare piece of American pewter in the Yale University Art Gallery has at last been identified. We at the gallery knew that the unusual object, almost five inches tall (not including its tube), was a medicinal implement acquired in 1931 and that it had been identified in print many times as an “infusion pot.” But the origin of the design and its intended use were unknown. It is a curiosity—the only known American example of this form that survives with its original leather-wrapped tube and wood and bone mounts. In 2011, history lecturer Rebecca Tannenbaum ’96PhD brought her freshman seminar, Medicine and Society in American History, to the Art Gallery to view medical-related paintings and objects, including the infusion pot. While preparing for the class, I realized that the object did not look like other infusion pots, and that I couldn’t explain to the students how it functioned. I began looking through period medical texts, and I happened upon a 1778 treatise that included a drawing and description of an “Inhaler” that exactly resembled Yale’s object. Mudge advised patients to mix “three drachms, or as many teaspoonfuls of Elixir Paregoricum”—a common household remedy that was a blend of herbs, alcohol, and opium—in a glass of water, and to drink the mixture about 45 minutes before bedtime. Then the patient was to fill the inhaler with nearly boiling water and retire with it to bed, where the pewter vessel would radiate comforting warmth. Every breath through the flexible tube would draw air into the holes in the hollow handle and through the hot water. The moist air would soothe the cough, as presumably would the dose of opium and alcohol. 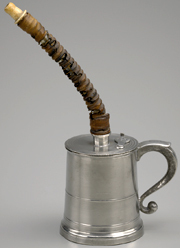 The inhaler in the gallery’s collection bears the maker’s mark of Robert Palethorp Jr., who worked as a pewterer in Philadelphia during the second decade of the 1800s. Not many examples of Pale-thorp’s work survive. But it makes sense that this rare piece was produced in Philadelphia, the birthplace of the nation’s medical profession—where Benjamin Franklin and Thomas Bond founded the first colonial hospital in 1751, and where the University of Pennsylvania established the first school of medicine in 1765. Palethorp’s inhaler is so similar to Mudge’s illustration that it was likely copied directly from an edition of the treatise that made its way to Philadelphia. Although Palethorp crafted his apparatus nearly 40 years after A Radical and Expeditious Cure was first published, the treatise went through multiple printings, and it still represented current therapeutic practice. In A History of American Pewter (1973), former Yale professor and curator Charles F. Montgomery noted that early American newspapers were filled with advertisements for cures for the cold and consumption. Palethorp’s pewter inhaler is tangible evidence of the link between American and British medical practice and the continued interest in therapeutic innovation.